The shrew is often mistaken for a mouse, a mole or a squirrel. 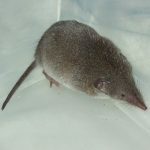 A shrew is approximately the same size as a mouse and has a long pointy nose and very sharp teeth. Shrews are very aggressive hunters and can attack birds, chipmunks and pets. They will gain access to homes through window wells or squeezing through tiny entry points. Inside the home they may feed on stored foods and contaminate them with feces and urine. There is a risk of disease transmission with shrews, so don’t attempt to pick it up if it gets in your home. Contact a wildlife removal professional. A common way to get shrews is if you have mice in the home. Shrews love to eat mice and take over their nesting spot. For them to stay indoors, they will need to have access to food resources and water. You can tell if a shrew is in your home as they have a strong unpleasant odor similar to a skunk. As a rule, shrews use this obnoxious smell as a defense mechanism and to mark their territory. The shrews activity is largely based on their dietary needs seeking out food when it is needed.